How fast do you want to go? Is speed important to you? This is the question to ask when determining your choice of engine capacity. For the sake of keeping this blog simple let’s just discuss the benefits of the 50cc, 150cc and 250cc engine sizes. This is the smallest engine and gets speeds of 35 miles per hour. Some US States don’t even require a designated license to operate a vehicle with an engine smaller than 100cc. Because of the small size of the engine and average speed of 25mph, the rider will get a return of 100 miles per gallon. Good gas mileage reduces when traveling at higher rates of speed but usually, never falls below 80mpg. Sticking with a 4-stroke engine as opposed to a 2-stroke – due to pollution issues, is favorable. Purchasing any scooter as well as a 50cc scooter can be done on-line, through a showroom, or individual and can be picked up for a little as $800 up to $1900 US. Great for first-time scooter owners, seniors who don’t need to commute every day and teens this is a great place to begin for the novice scooter buff. A popular make and model in the 50cc range is the Roketa MC-08 50. Its air-cooled engine runs at 3.3 horse power and has a top speed of 25MPH getting the owner that sought after 100MPG fuel savings. This little hummer does require a motorcycle license to operate on the streets. This class includes engines between 100cc and 200cc and can get you hauling down a country lane at 60 to 70 miles per hour. This is the size that most of our members find to be most useful. Few of us really have a need for speed, but it comes into play when traffic is heavy and a little extra (speed) cash in the bank comes in handy. Of course, you are going to pay more for the 150cc scooter, but finding a spiffy model for around a grand will not be difficult. Paying a little more means topping out at about $3000 spanking new and customized – depending on the dealer and add-ons. 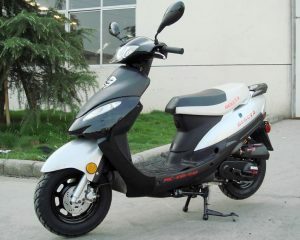 Most of our members want to buy American and find that the 150cc Moped manufactured by Global Trailer in any one of their models from the unique Three Wheel Bonzai to the Sicilian to the Horizon are all top choices. OK, say you have a need to feel like one of the big guys without going all the way to an American Eight Harley-Davidson, then a “maxiscoot” is for you. Reaching cruising speeds of 80MPH this compact bolt of lightning will keep you at the head of the pack. Three members of SoCo Scoots have the big guns and each owns a NST Viper 260. They tell me that the automatic transmission is as smooth as silk. They like the 70MPH thrust that the 16.6HP, liquid cooled Linhai/Yamaha engine delivers and don’t complain about the 60MPG fueling costs. That’s the news from the club. 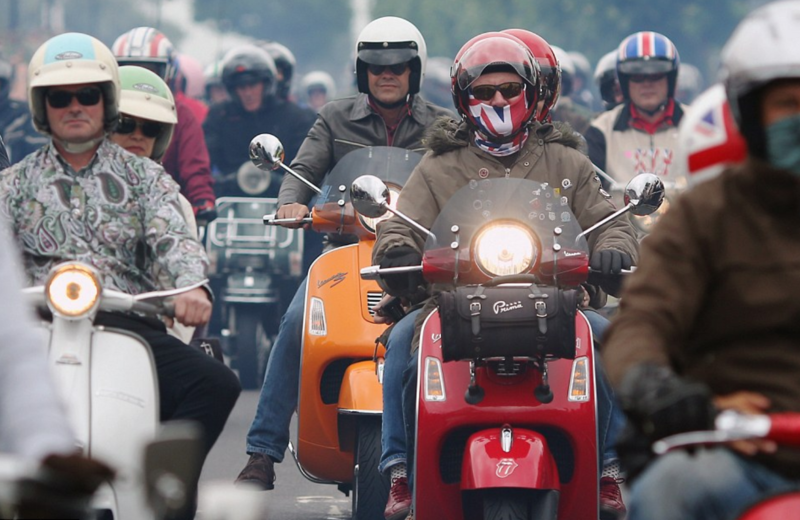 The most popular scoots in our circle. What is your recommendation? Leave a comment below and tells more.